Candlewood Suites in Hot Springs located at central Arkansas, is two miles from historic downtown Hot Springs and less than an hour from Little Rock. The hotel is conveniently located in the heart of Hot Springs, close to all of the area attractions. Our Hot Springs hotel is in close proximity to local businesses. You can stay connected using the free high-speed Internet access. Other choice amenities include an on-site convenience store, a meeting room, complimentary guest laundry room, a 24-hour fitness center and once a week room cleaning. The hotel feature conference room which can accommodate up to 50 people. This room is available for rental. • Clean up fee $35 Please visit our website for more details. Our meeting space accommodates up to 50 guests and is able to be transformed in to anything you desire! We host baby showers, small weddings, reunions, business meetings, seminars, support groups and so much more!! 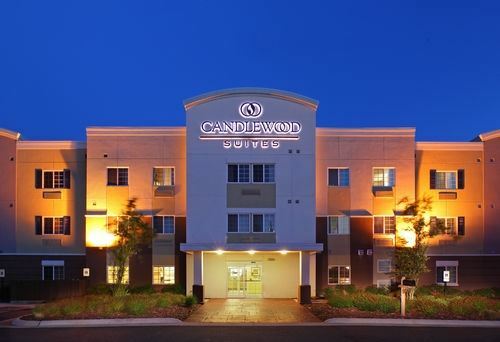 Candlewood Suites is centrally located on Central Ave less than 1 mile south of Oaklawn racing and gaming and less than 5 miles south of the historic bathhouse row! For a tour or reservations give me a call at 501-624-4000!